Jordanian Waqf assembles generator on the Mount without permits, architect reveals in special Arutz Sheva interview. The Jordanian Waqf continues to build illegally on the Temple Mount, photos leaked to Arutz Sheva revealed Wednesday. The photos, which were taken by a visitor to the Mount, show what appears to be new construction, under a tarp, in the northeast corner of the Mount. To clarify whether the Waqf has the license to build on the Mount - and what ramifications there may be if it does not - Arutz Sheva spoke to architect Gideon Charlap, who turned to the licensing and inspection bureau in Jerusalem "to address urgently the building violations and illegal construction on the Temple Mount," as he put it. Charlap makes it clear that the pictures shows that the "Waqf is building without a permit from anyone," and added that its official statements claiming that generators added to the site were provided by the Jordanian King are false. According to Charlap, the Waqf simply bought the generators from Israel at full price - then added them to the Temple Mount compound without official authorization. "The power of these generators is huge and disproportionate [to the size of] the Temple Mount," he added. "They can light up with that half the old city." Charlap maintained that the addition of the generators "damages Israeli sovereignty." Charlap explains that "anyone who builds these huge generators must comply with safety, fire protection, security, solar and diesel fuel [regulations] etc. I went to all the authorities such as the Ministry of Defense, Ministry of the Home Front Command and more [over it] and now they are trying to create a safety cover but this further undermines the architecture of this holy place." "We have to do archaeological excavations here intelligently, without damaging the landscape, without damaging the artifacts," he continued. "They are not the owners. A landlord can ask for an application for a permit, but they are not the owners - so they cannot apply for a permit at all." "The Waqf cannot build what it wants and when it wants," he added. Charlap is still waiting for an official response over the issue from Jerusalem, as well as from various government organizations. The Waqf, which was left in charge of the Temple Mount after Israel liberated it during the 1967 Six Day War, consistently destroys Jewish antiquities on the compound in a direct violation of a ruling by the Supreme Court. It also regularly builds on the site without a permit. 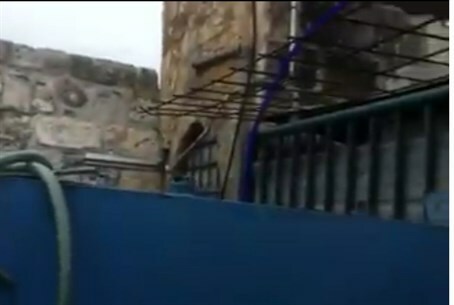 In January, Temple Mount rights activist Yehuda Glick caught officials illegally drilling on the ancient holy site. The drilling was later revealed to have been establishing placeholders for dozens of trash cans.